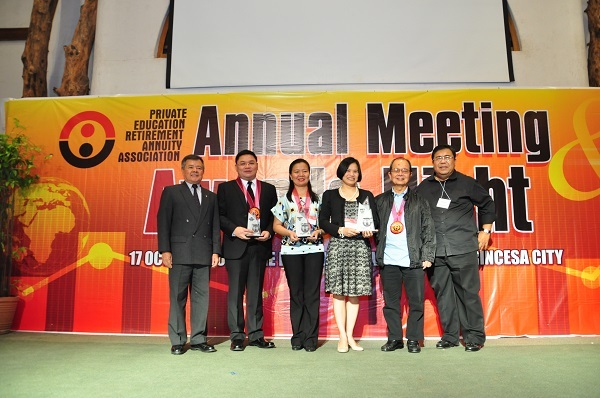 Beyond the honor and recognition given to the year’s Outstanding Participating Institution (OPI) is a call for all PIs to build their retirement assets through Reserve Fund (RF).The cash award for the OPI winners are directly credited to the institution’s Reserve Fund account and in case it has none, an RF account is opened. The PERAA Chairman, Fr. Antonio Samson, S.J., noting that ‘contributions made by the school under the individual member’s account are generally not enough to pay the school’s obligations, explained at the latest Administrator’s Conference that ‘If the school has money in the Reserve Fund, it can fund to pay the whole retirement (for a retiring employee)’. The OPI award is given to a member school for exemplary and consistent implementation of its retirement program under PERAA for the past five years. Qualified Participating Institutions (PIs) are those with a minimum of 50 employees that has PhP 5M accumulated value and has an Up-to-date payment status. The increase in total accumulated value of the PI, gross contributions and per capita value were also considered in choosing the awardee. For Fiscal year 2013-2014, the OPI award went to the University of St. La Salle, Bacolod City. It is headed by its president and currently a member of the PERAA Board, Bro. Raymundo B. Suplido, FSC. It was established in 1952 by three American Brothers under the umbrella of the Philippine Province of the Brothers of the Christian Schools which is an international institute of religious dedicated to the service of mankind with special concern for the poor, through education. They joined PERAA in May 1997. Second Runner-up was MGC New Life Christian Academy of Taguig City. The school joined PERAA in December 1991. MGC is a bible-based school and is headed by its principal, Mrs. Helen Kwong Villanueva. The school offers courses of study from Pre-Nursery to High School 4. East Asia Educational Foundation, Inc. which joined PERAA in June 1995 was the Third Runner-up. It aims to develop computer professionals who will be prepared to fulfill the demands of business and industry. Its president is Dr. Michael M. Alba.